The ten hectares of vineyards surrounding the farm holiday have been dedicated for more than 20 years to the production of excellent wine, grown in the highest respect of the environment and according to the organic method, which only allows the use of natural fertilisers. Neither herbicides, nor chemical insecticides are used in our vineyards. All the grapes are carefully picked and harvested by hand, according to the traditional wine-making. Rightly considered “the King” among the wines of our territory, Pignoletto is the most typical native grape variety in our province. Many attribute the name to a wine called “Pino Lieto”, which would have been described by Plinio the Elder (I century AD) in his Naturalis Historia, while others attribute the name to the typical shape of the grape, similar to a small pine cone (pigna in Italian). Pignoletto is a prestigious white wine, characterised by a typical light yellow color, a delicate flavour and a well-balanced taste. Originally from Burgundy area (France), this famous vineyard takes its name from Chardonnay, the homonymous village of Burgundy, where it was planted by the monks of Pontigny Abbey. From late 19th century it has gradually spread all over the world. 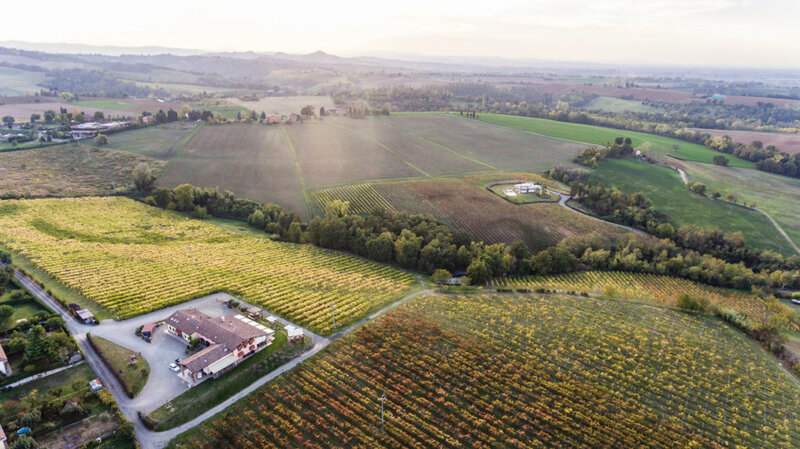 The original environment of this vineyard is very similar to our Bologna hills: limestone, clayey and well-drained… a perfect place to plant Chardonnay vineyards. This straw-colored wine discloses a characteristic, delicate and fruity scent (of apple, banana and pineapple in particular). The taste is elegant and harmonious, with remarkable mineral notes. Cabernet Sauvignon is a wine born in Bordeaux, France, and imported to Italy by the end of the 19th century. Cabernet Sauvignon is a complex wine, generally very aromatic, that expresses all the wonders of the woods and the uncontaminated nature. This wine has well-recognisable traits, regardless of the area where the grapes are grown or the techniques of wine-making: it is very resistant to different climatic conditions, always keeping intact its organoleptic characteristics. The red fruits (raspberries, currants) and herbs (pine needles, oak leaves) will appear mainly in the smoky, but a more careful analysis will reveal the most organoleptic characteristics of the more material that are bound to the rock. From 2017 our wine cellar hosts the great sparkling range of Conte del Tellaro, which borns from the original idea of reinterpreting the renowned Sicilian grapes Grillo and Syrah with the sparkling Martinotti-Charmat method. The resulti s a fresh, innovative and unique range of products, which has simply conquered us. Have a look!